An Acid Mothers Temple unit formed in 2013 at the request of our Spanish booking agent, who wanted to see Acid Mothers Temple playing Black Sabbath. A new unit was duly formed and toured the Iberian peninsula. Originally the group’s existence was to be limited to this one tour, however we realised that both AMT＆The Melting Paraiso U.F.O. and AMT＆The Cosmic Inferno had long moved beyond their original psychedelic heavy rock roots to play a wide range of music. 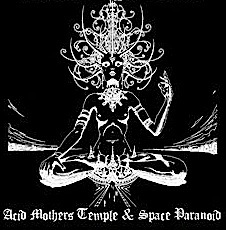 So we decided to keep Acid Mothers Temple & Space Paranoid as a permanent unit that would focus just on spacey heavy rock. We were determined to draw a line between us and the many doom metal and black metal bands who have also been inspired by Black Sabbath. So, placing Sabbath back into the early seventies context of their birth, we have defined them as a British blues rock band. To this template we have added sixties psychedelic elements, as well as an improvisational approach (something that Sabbath virtually never do live), and we have attempted to reconstruct their songs in heavier and spacier way. The group will not limit itself to Black Sabbath covers, but will consider to explore the possibilities of ever spacier, ever heavier blues rock.